Do contemporary welfare policies reflect the realities of the economy and the needs of those in need of public assistance, or are they based on outdated and idealized notions of work and family life? Are we are moving from a "war on poverty" to a "war against the poor?" In this critique of American social welfare policy, Sanford F. Schram explores the cultural anxieties over the putatively deteriorating "American work ethic," and the class, race, sexual and gender biases at the root of current policy and debates. Schram goes beyond analyzing the current state of affairs to offer a progressive alternative he calls "radical incrementalism," whereby activists would recreate a social safety net tailored to the specific life circumstances of those in need. His provocative recommendations include a series of programs aimed at transcending the prevailing pernicious distinction between "social insurance" and "public assistance" so as to better address the needs of single mothers with children. Such programs could include "divorce insurance" or even some form of "pregnancy insurance" for women with no means of economic support. By pushing for such programs, Schram argues, activists could make great strides towards achieving social justice, even in today's reactionary climate. "This engagingly written book lays bare the `dirty little secrets' of a new order of social policy, one that shores up inequality by tapping into cultural reserves of race and gender prejudice while publicly presenting a neutral face. Its power derives from Schram's eloquence, his sharp wit, and his talent for persuading the reader to scrutinize social policy through the lens of social theory." "If you want a flesh-and-blood story of the real agendas that lie behind policy-making in the age of tough love, After Welfare is the best book on the topic. Schram's incisive expose makes for spectacular common sense." 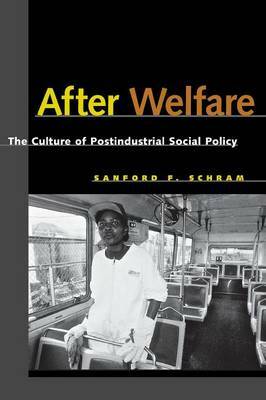 "Sanford Schram's After Welfare is an exemplary combination of political theory, cultural critique, applied policy analysis and astute and comprehensive mapping of the contemporary politics of welfare. It should engage a wide readership in both academia and the policy community." "By focusing squarely on the cultural dimensions of social welfare policy, Sanford Schram brilliantly illuminates recent turns in policy and politics. Nor does he slight the material for the symbolic. Rather he shows the close connections between the cultural and material aspects of policy. Most welcome of all, Schram's work is imbued with a rare empathetic concern for the people who are both the beneficiaries and victims of social welfare."